The 2014 Order of Merit Grand Final. WELLINGBOROUGH Golf Club’s Ellie Darnell has completed a notable double in a special competition for promising young golfers in Northamptonshire. After qualifying through a season-long Order of Merit, Ellie went on to match her win of 12 months ago at the Grand Final held at Northants County Golf Club. Ellie finished the day as girls champion for the second time with a score of 83 while the new boys’ champion is Tom Forster, of Oundle GC, who went round in 73. Twelve qualifying junior opens are used throughout the summer to determine the leading players from an Order of Merit organised under the umbrella of the Northamptonshire County Golf Partnership, who then battle it out in the winner takes all finals day. In the nett competition, it was a case of third time lucky for Hattie Billson, from Northants County, who took the top prize with a return of 76 after finishing third last year and second in the inaugural competition. Sister Millie was runner-up. The boys’ nett winner was also from the host club, with Fergus Robinson repeating his win of two years ago with a total of 71. At the prize presentation thanks were given to the golf clubs around the county for their support in hosting the 12 qualifying events with arrangements for next season well in hand. Details of how to get involved will be posted on the Northamptonshire CGP website in due course. 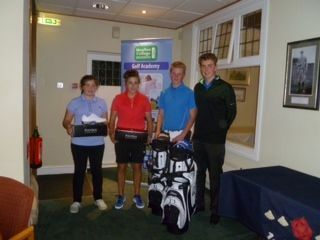 The final showdown, held for the third time, was supported by Moulton College as well as Footjoy/Titleist. Competition co-coordinator Richard Lobb says: “The 12 clubs who hosted a junior open are to be thanked for their efforts in putting on a well-managed and highly competitive event. “Support at the events has been good, and these events provide up and coming young players with an opportunity to test their skills competitively across a number of different venues while enjoying the friendly side of the sport, too. As a junior member of a club in Northamptonshire we wish to invite you to play in ‘The Race to the ORDER of MERIT GRAND FINAL 2014’. The Grand Final is the season end finale for the top junior boys and girls around the counties clubs. Each summer throughout the county a series of junior ‘Open’ golf competitions are run by those clubs that hold ‘GOLFMARK’ status. To qualify for the final each competitor MUST play in a minimum of 5 events. You can play in all events BUT your 7 best results of the season will be used for the final qualification tables. The more you of the 13 qualifying competitions you play in the more chances you have of qualifying. The ‘Order of Merit’ qualifying competition will be run for both boys and girls using the gross and nett scores after each junior competition. The tables will be formed by allocating points to the top 20 finishers at each event using both the gross and nett results. Places at the final will be allocated to those players who finish in the Top’ 12 boys – gross, ‘Top’ 12 boys – nett, ‘Top’ 6 girls – gross, ‘Top’ 6 girls – nett for each table. Those that finish in the qualifying positions will be win place in the ‘Grand Final’ held at Northants County Golf Club on the 29th October 2014. This will run along side the Junior Open event hosted by sponsors Moulton College. Prizes for the Grand Final will be supported by Titleist/Footjoy and Moulton College.